1. 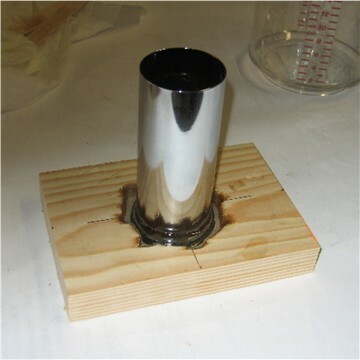 Slip a 1" pipe through a 4" stainless steel tailpiece and set the ends of the 1" pipe between two mounts. Using a hammer and center punch, pound deep dimples around the base of the tailpiece, within 3/4" from the bottom. The purpose of the 1" pipe is to prevent deformation of the tailpiece while pounding on it. 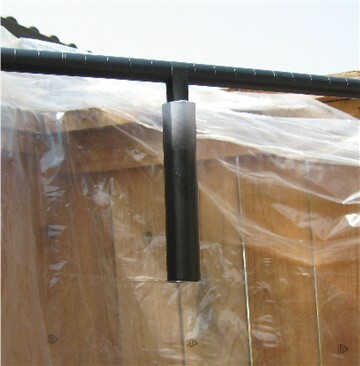 The 1" pipe shown in the picture just happens to have grip material around it from a previous project. It's just what I had on hand. After pounding in the dimples, cut some slots into the flange of the tail piece using the edge of a file. 2. Mark a 5" space on a 1 x 4 (or whatever your preferred length of handle would be), and draw a 2" DIA circle in the middle. Drill large holes around the perimeter of the circle. I used a 3/8" drill bit. 3. 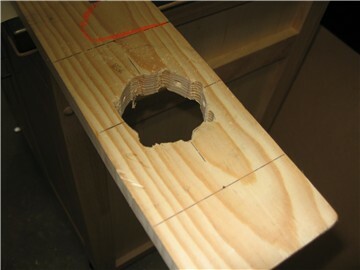 Cut the circle out using a hand jig saw, and then drill a few small, shallow holes around the inside surface of the hole. This is all done to hold the casting resin in place that will be applied in a later step. 4. 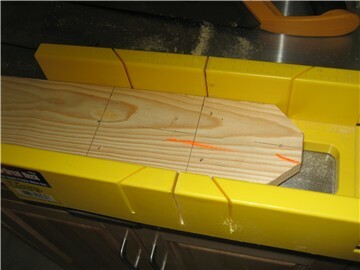 Cut out the length of 1 x 4 and then tape over the hole on the side you want facing outward. I used white duct tape. 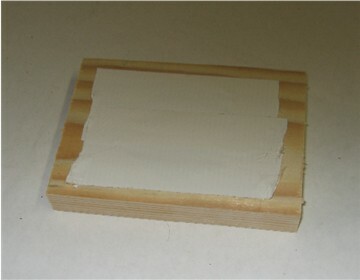 If the tape you use overlaps, make sure that one piece is firmly adhered to the other. 5. Place the cutout 1 x 4 on a surface with the taped end down on the surface. Fill the holes up to just below the rims with casting resin. You want to account for displacement when you place the tailpiece into the hole. For a casting resin I got EasyCast by Castin'Cast from Michael's hobby store. You could also find casting resin at a tile store. A measuring cup is an essential item. I picked up an inexpensive plastic cup at Walmart's. You might also need another cup. I have a bunch of red plastic cups like the one shown. The directions instructed that once the resin is mixed, to transfer the mixture to another cup for further mixing. I did this and then transferred the mix back into the measuring cup for pouring. Casting resin is some very sensitive stuff, so read the directions thoroughly and follow them to the tee! Have on hand a lot of mixing sticks and paper towels. Resin that drips will seep through paper and adhere to whatever surface you're working on, so be sure to use several layers of paper or wax paper. If any gets through, it will leave a thin layer of plastic which can be scraped off later. 6. 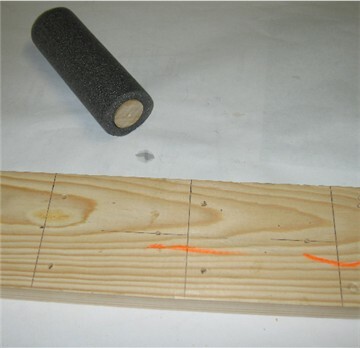 Place your tailpiece into the hole of the 1x 4, so that it is sitting on the tape below. Once the tailpiece is seated, allow the resin to settle for a bit and then carefully add some more, if needed. If there is any spill over, grab a mixing stick and push the resin towards the hole with the side of the stick - like a squeegy. If any resin gets on the upper ends of the tailpiece, wrap a paper towel around your finger and wipe downwards to remove it. Once the casting resin is poured, don't move the 1 x 4. Don't touch it 24 hours. 7. Mark off two 4" lengths on a 1 x 4. These will be the side supports of the handle. 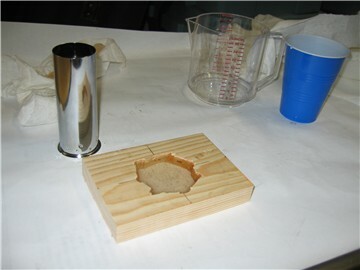 From the top of each, measure down 3/4", centered, and drill a hole for a #8 x 1 1/2" flat head wood screw. 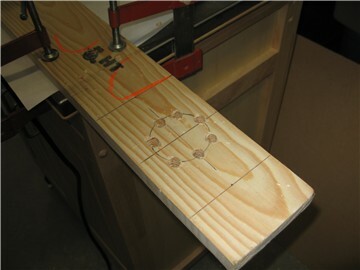 From the bottom of each, measure up 3/8" and drill two holes for #8 x 1 1/2" flat head wood screws. Chamfer the holes on the side of the wood you want facing outward. 8. Cut a 5" length (or whatever you want your handle length to be) from a 1" wooden dowel. Drill guide holes centerd on each end for #8 x 1 1/2" flat head wood screws. 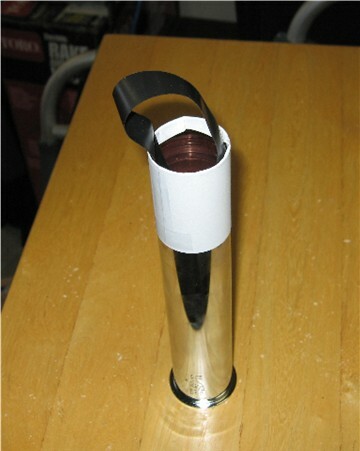 Wrap the handle with whatever type of grip you choose to use (see the "Useful Tips and Information" page for ideas). I cut out a 5" length of foam pipe insulation and slipped it over the handle. 9. Cut off the top of one side support and then measure in 1 1/8" along the top on each side and, from those marks, cut 45 degrees off of each side. Cut off the bottom of the side support and then do the same for the other side support. After cutting out both side supports, round out the edges of the 45 degree cuts with a file and then sand all edges to suit. 10. After having allowed the casting resin to cure for a full 24 hours, place the unit between two mounts so that the the tailpiece is suspended between them. Using Elmer's Wood Glue, glue and screw one side support to the bottom unit. 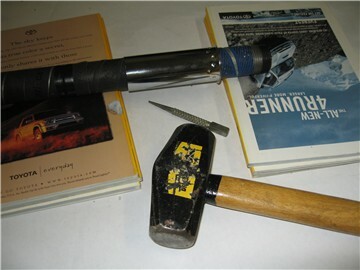 Whenever possible, I like to clamp items together that I am going to screw together. Glue and screw one end of the handle to that same side support. 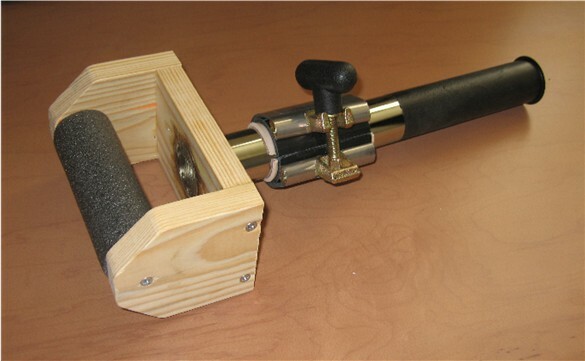 It is important that you use glue, as you don't want the handle, itself, to be able to rotate within the handle unit. 11. Finish putting the handle unit together. Do nothing more with it, as the casting resin has to be allowed to fully cure. 12. For the straight handle, go to the "Useful Tips and Information" page for grip ideas. For my handle, I decided to coat it with Plasti-Dip. I cut a sheet of paper 2 1/2" wide and wrapped it around an 8" tailpiece, 2" from the top. The remaining 1/2" I tucked into the inside of the tailpiece. I then took a length of vinyl tape and taped one end of it to the inside of the tailpiece, looped it around, and taped the other end to the other side of the tail piece. 13. I hung the tailpiece from a pole and then sprayed it with 5 coats of Plasti-Dip, allowing 30 minutes between each coat as prescribed. After allowing it to dry for 4 hours, I took the tailpiece down and removed the tape and paper. AND NOW FOR THE KILLER PART.......THE WAIT! The Casting Resin I got says that the resin is cured after 72 hours. I wanted to be absolutely sure that the resin was rock hard and didn't attempt to finish my Leverage Roller until at least 72 hours after the resin had been poured. 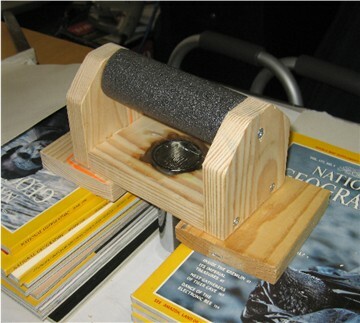 In the meantime, go to the Grip I page and find the Hand-Held Wrist Roller to see how to make the clamp. 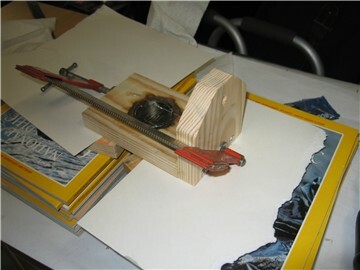 Once the clamp has been made, finish the Leverage Roller using the picture at the top as a guide.